Regular visitors will be aware that Gentle Reminders is being serialised right here on SFBook courtesy of the kind author Martin Perry. It therefore only seemed fair that I read and review the book that some of you good readers are indeed reading. The novel is the first in a series that is part of the Legacy Universe and follows the mercenary group who fly the Jump Cannon, a spaceship with a serious reputation within its field. When the crew are kidnapped it becomes clear an old enemy and a new deadly foe are threatening not only the ship but the very future of every race in the universe. Hunted by The Gentle Reminder and facing a constant mental and physical challenge the crew of the Jump Cannon battle through a voyage of discovery which could have life changing consequences not just for the crew but the whole of the Legacy Universe. The real strength of this novel is undoubtedly the characters, each are brought to life in an effective way and the interplay between this dynamic group of miss-fits is just great. This is even further enhanced by the use of some very well described aliens, the Legacy Universe is just teeming with a myriad of different species and the author does a great job of describing each. There are also a lot of good ideas at play here and the plot has been clearly though out in a great deal of detail. The action sequences also work really well, descriptive but fast paced and immersive but the pace of the story itself feels a little uneven and the plot stalls in a few places. The actual story does more than make up for this however and I loved how this rag-tag group seemed to slide from one dangerous situation to another. The main antagonist is deliciously dark and depraved and if anything I would have loved for her to have had more space in the story. As this is the first volume in a planned 7 novel series you can tell that the bigger story arc is only just warming up and the ending is left very open ready for the next novel. 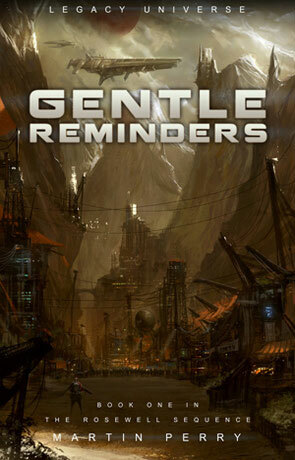 Gentle Reminders is a rewarding novel with great use of strange aliens, crazy situations and above all a great deal of fun, recommended. Written on 24th February 2012 by Ant.